Avid readers of the Port Philip Weekly free paper may have noticed a familiar story recently about the near useless 'Civic Guides' that dot the suburb. In fairness there is actually a much more useful guide map provided by the council at the tram terminus. Unfortunately for a casual visitor, it covers an excessively large area, was produced before the advent of the bike share scheme, and has a walking time to South Melbourne of 35 minutes from there ... which must've been tested by the resident speed walker. This shows the locations of the two bike share stations, and both the off-road (solid blue) and on-road (dashed blue) bike paths. 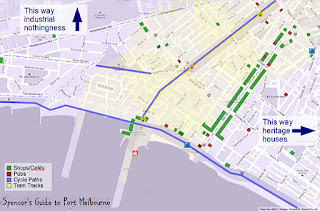 It shows the location of the three 109 tram stops; the yellow circles indicating an approximately 5 minute walking radius. Finally the green and red sections show what residents already know, but is not obvious to cruise ship arrivals; that the vast majority of shops, cafes and pubs line Bay Street. 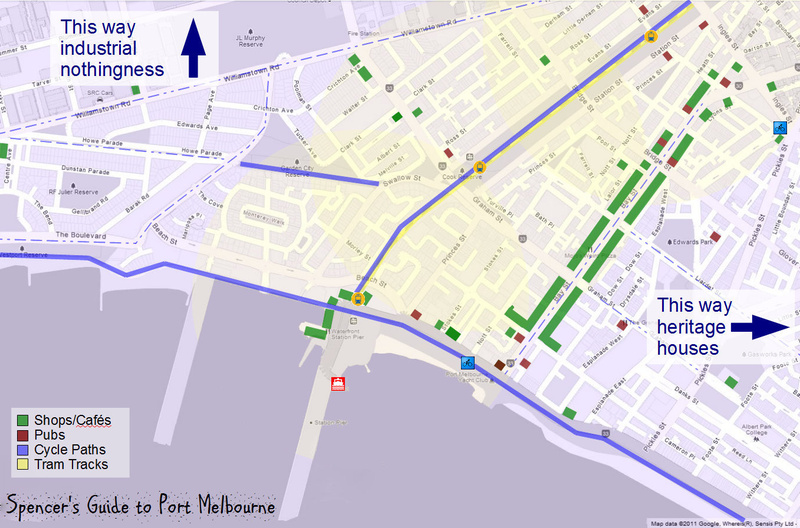 However hopefully this map will help a few people discover a surprise or two in the back streets.